The plant is the source of the drug Vasaka, particularly in the treatment of Bronchitis. Several alkaloid are present in the drug of which the important ones are Vasicine and Vasicinone. Adhatoda are extensively used for treating cold, cough, asthma and chronic bronchitis. The pulp of leaves is given in fever, enlargement of liver, spleen, skin diseases, piles, jaundice, rheumatism. The pulp of roasted leaves, mixed with honey, is given in cold and cough. Triterpene glycosides, bacopasaponins, luteolin, apigenin and bacoside. It is a classic and nerve tonic. Brahmi juice, prepared in ghee, is given orally to the infants in small doses for goodmemory. 5-10 ml leaf juice is given to children in case of constipation. Root bark contain three alkaloids ajmalicine, serpentine, reserpine. 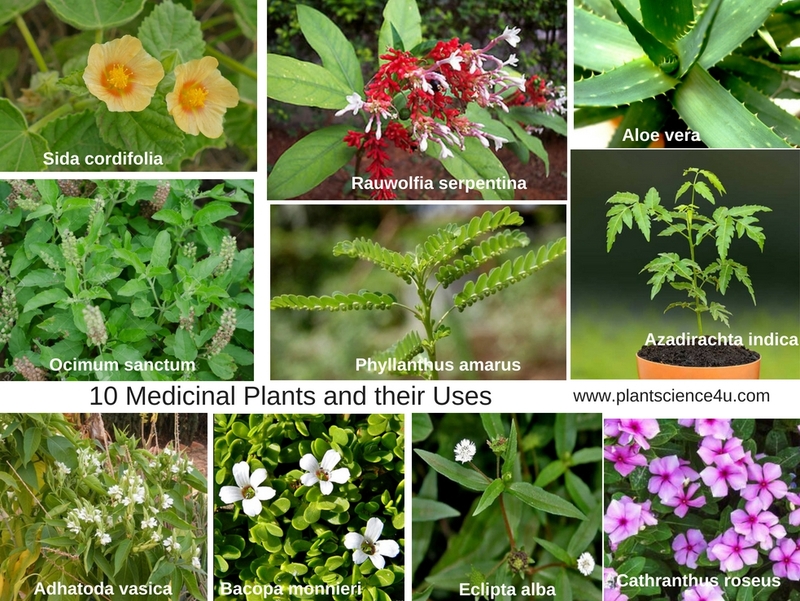 These alkaloids possess hypotensive, sedative and transquilling properties. Anti-cancer drugs: Vinblastine, Vincristine and leucocrostine. The leaf extract of Eclipta found to be a powerful liver tonic. It is good for hair growth. A black dye is obtained from Eclipta, is used as a dye. The plant essence is extracted as a rasayan for longevity and rejuvenation. It is used against dysentery, anemia, eye diseases, asthma and liver cirrhosis. Its different parts are used in Ayurvedic treatment. Neem oil, extracted from the seeds, has insecticidal and medicinal properties. Neem seed cake is rich in organic contents and it enhances soil fertility. It is also an effective nematicide. Neem has anti-bacterial properties and it is used again skin infections. Neem leaf capsules are used as an insect repellent. Neem oil and leaf extract are used to manufacture beauty care products. leaf juice is given against chronic fever, haemorrhage, dysentery. It is also used to check vomiting and as an antihelmintic. This plant has a reputed position in Ayurveda and Unani systems of medicine. It is used against bronchitis, anaemia, urinary problems, asthma and also as a diuretic. In Unani system, it is stomachic and useful against chronic dysentery. Fresh roots serve as an excellent remedy for jaundice. Bark yieldsa Vitter principle, called phyllanthin. It lowers blood pressure and controls schizophrenia like symptoms or mental illness. Reserpine obtained from Rauvolfia, it is an effective remedy for hypertension. Root decotion is given for uterine contraction. The plant is used in Ayurvedic medicine. Used for the treatment of inflammation of the oral mucosa, nasal congestion.